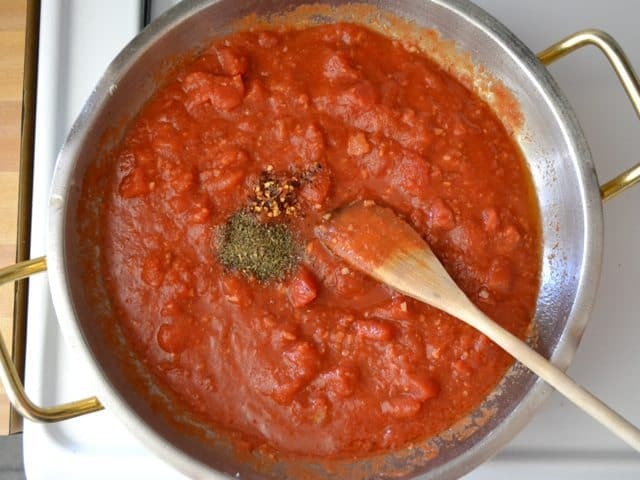 I got an email a while back from a reader who wanted to know how to make arrabbiata sauce, so I set out to find out how to do so. I found that it’s actually pretty much the same as the red sauce in my Spicy Tomato & Shrimp Pasta, which is super easy and delish. The concept is simple: tomatoes + garlic + spicy red peppers = YUM. I wanted to do a chicken version to give the sauce more flavor and depth, but I also can’t wait to try a vegetarian version with sautéed eggplant. Why angry birds? 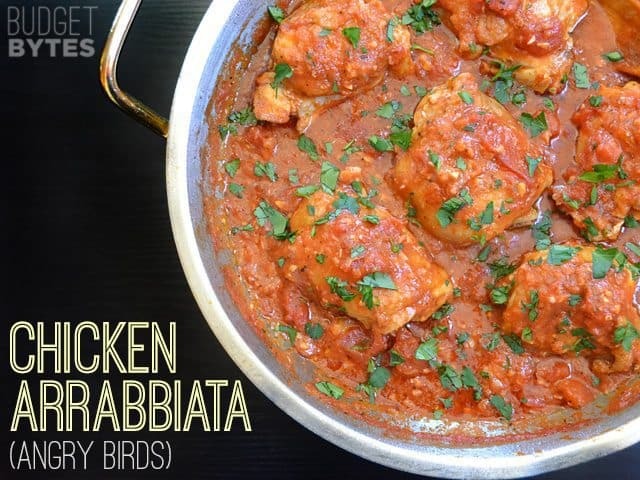 Apparently “arrabbiata” translates to “angry”, so this is angry chicken… or angry birds! Okay, a bit of a stretch, but it still made me laugh. I used bone-in, skin on chicken thighs, but you could probably use chicken breasts instead (they will provide slightly less depth of flavor than the bone-in kind, but still be yum). If using breasts, I would suggest pounding them out with the technique used in this recipe, which will make this whole dish cook much faster. The bone-in thighs that I used require more cooking time because they are thick and take longer to heat through. So, let’s play some angry birds, shall we? 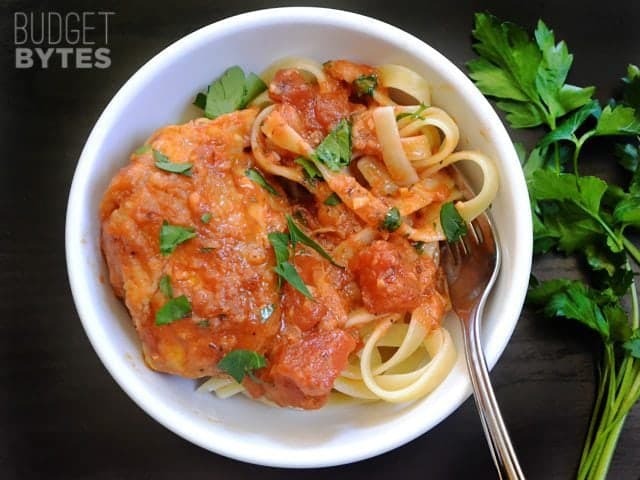 Chicken Arrabbiata is a simple dish with a rich, flavorful, and SPICY red sauce. Serve over pasta or rice. 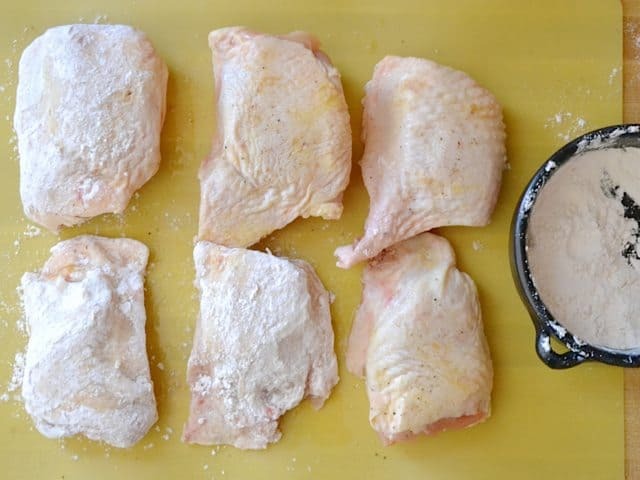 Season the chicken thighs with a pinch of salt and pepper, then dredge each piece in flour until they are lightly coated. Heat the olive oil in a large skillet over medium heat. When the oil is hot (it will sizzle if a pinch of flour is dropped into the oil), add the chicken. Brown the chicken on both sides (5-7 minutes each side), then remove the chicken from the skillet. While the chicken is browning, mince the garlic. 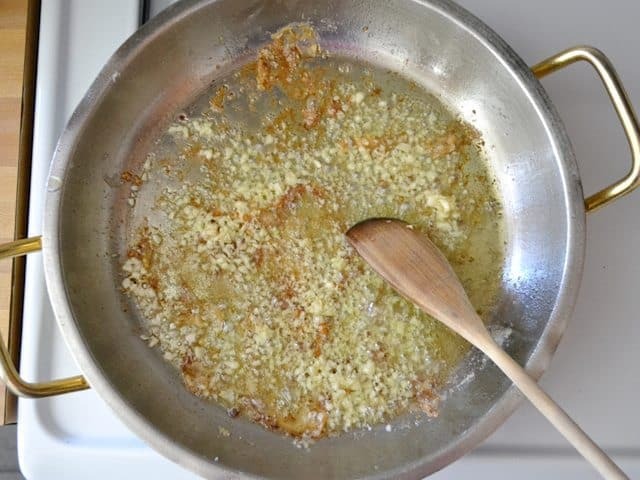 After the chicken is removed from the skillet, add the minced garlic and sauté briefly (1-2 minutes, or just until the garlic is soft, but not brown). 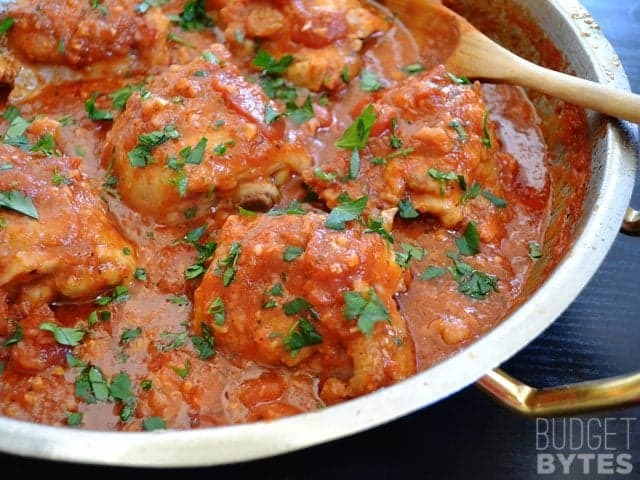 Add both cans of tomatoes with juices, basil, crushed red pepper, and chicken broth to the skillet. Stir to combine. Return the chicken to the skillet with the sauce, and spoon some sauce over top of each piece. Allow the sauce to come up to a simmer. Simmer the chicken in the sauce for 30 minutes, turning the chicken over half way through to make sure both sides receive adequate heat. Serve the chicken and sauce over cooked pasta and garnish with roughly chopped parsley. Make sure your skillet is big enough to house six chicken thighs. 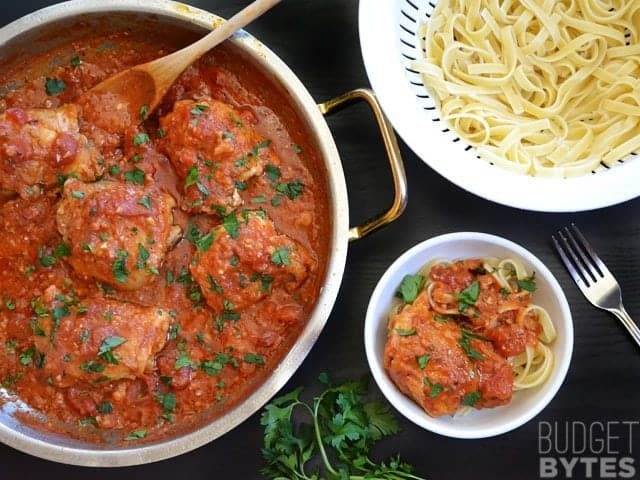 If not, reduce the chicken to four pieces, but keep the rest of the ingredients the same and you'll just have extra of the delicious sauce for each of the four servings. I made six chicken thighs, which may have been a bit ambitious. I had to use my largest skillet. If you don’t have a skillet large enough to hold six chicken thighs at once, just make four, but keep the sauce ingredients the same. This type of skillet would be great for this dish. Season each piece of chicken with a little salt and pepper, then dip the chicken into a shallow bowl of flour to coat it lightly. The light coating of flour will caramelize in the skillet and give a lot of flavor to the sauce and help keep it thick and rich. Heat 2 Tbsp of olive oil in a large skillet over medium heat. When the oil is hot, add the chicken. You can test to see if the oil is hot enough by dropping a pinch of the flour into the skillet. If it sizzles, it’s ready. 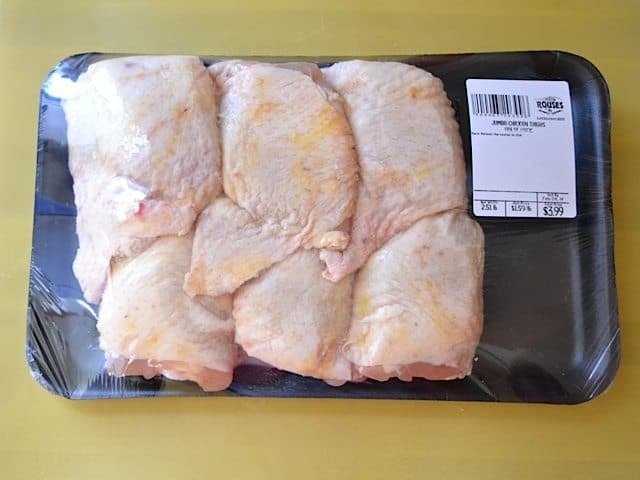 Brown the chicken on both sides (5-7 minutes on each side). If the chicken sticks to the bottom of the skillet, it’s okay. When it gets to the right stage of “brown” it usually loosens and releases from the skillet. If little pieces stick, it’s okay because that will just add more flavor to the sauce. After the chicken is browned, remove it from the skillet onto a clean plate. While the chicken is browning, mince four cloves of garlic. After the chicken is browned and removed from the skillet, add the minced garlic, and sauté it just for a minute or so to soften it up. Next, add the two cans of tomatoes. I used one can of crushed and one can of diced for a little more texture. 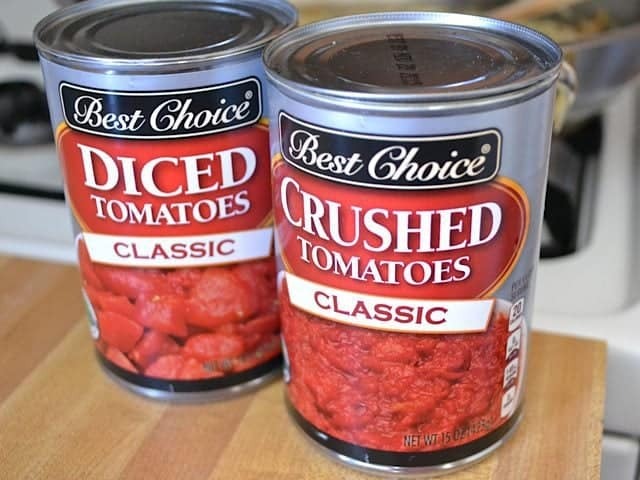 Crushed tomatoes are fairly smooth in texture (not quite as smooth as sauce, but no large chunks). Also add 1/2 tsp dried basil, 1/4 tsp (or more) of crushed red pepper, and a half cup of chicken broth. I only added the chicken broth because I knew the sauce would be simmering for a while and it would need just a touch more moisture to keep from drying up too much. If you don’t have chicken broth, don’t fret. You can use water or even white wine if you have it (I used Better Than Bouillon brand broth base to mix up just 1/2 cup). After you stir the sauce together, add the chicken back to the skillet and spoon some sauce over top. Let the sauce come up to a simmer. Simmer the chicken in the sauce for about 30 minutes, flipping the chicken half way through. 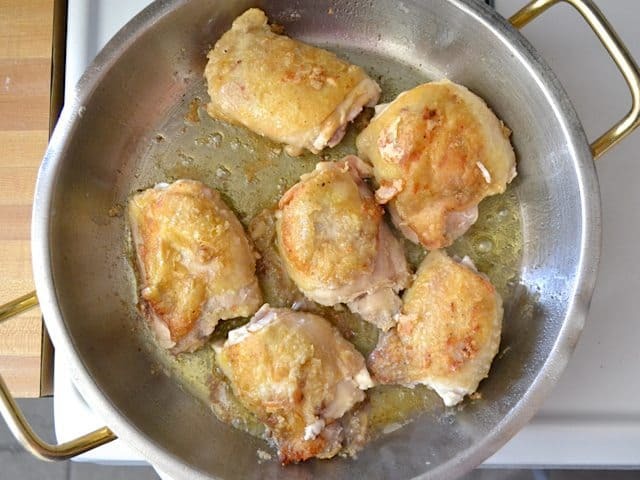 If you have a lid for your skillet, you can probably cook for a shorter amount of time and not have to flip the chicken because the heat will be well contained in the skillet and come from all sides. You probably also will not need that extra 1/2 cup of liquid/broth. When it’s finished, the sauce will be thick and rich (I couldn’t stop eating the sauce off the spoon!). You can garnish with a handful of chopped parsley, if desired. 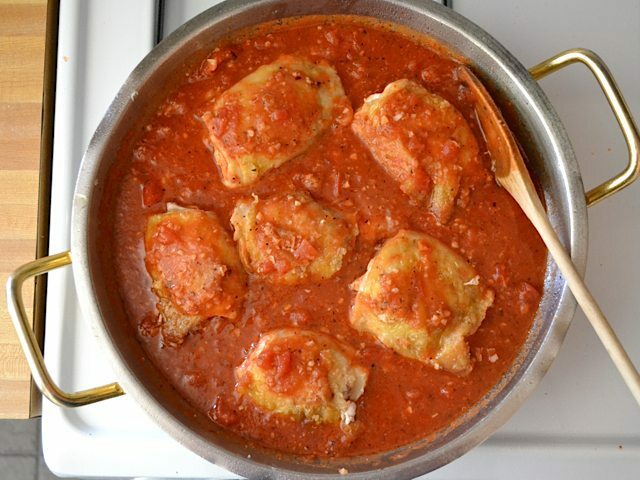 This can be served over pasta or rice – anything to soak up that wonderful, angry, sauce! My thoughts exactly. As I mentioned in my previous comment, there’s no right or wrong way to make Arrabbiata sauce. According to Federica, I was questioning someone’s expertise when it comes to recipes. I find her argument silly, because it was pointless and stupid. SMH!!!! You don’t have to be Italian to make arrabbiata sauce. Who cares!!!! I’m glad everyone liked this recipe, but this is not the recipe for Arrabbiata …. first of all you don’t need chicken! it’s a sauce for pasta, and only pasta … penne possibly .. penne all’arrabbiata was my mother favourite. So, to prepare the sauce you will need:olive oil, grondmothers’ conserva (maybe you don’t have it, you can use tomatoe sauce with a bit of salt and olive oil… and fresh basil), hot peppers and bacon (or mushrooms) . you cook the pasta in boiling water and then you transfer it in the sauce pan… and you it it. ABSOLUTELY NOT CHICKEN! There’s no right or wrong way to make Arrabbiata sauce, so it’s okay to make a recipe your own. That’s exactly what Beth did. I’ve made Chicken Arrabbiata plenty of times, and honestly it’s delicious. Instead of criticizing Beth’s recipe, stick to your own version of Arrabbiata sauce because no one’s going to stop you from enjoying it. I’m not questioning anyone’s expertise. Since some people are criticizing Beth’s recipe for Chicken Arrabbiata, it’s best to stick to your own version. There’s no need to argue about it. I FOUND YOUR WEBSITE TODAY AND I LOVE YOUR RECIPES! ( I HAVE NEVER EVER MADE COMMENT ON ANY SITE – YOURS IS EXCEPTIONAL. (SIMPLE , ECONOMICAL WITH BOLD FLAVORS – SO HAPPY I FOUND IT. TONIGHT I MADE YOUR CHICKEN ARRABBIATA AND IT WAS REALLY GOOD . THE FAMILY LOVED IT. I DOUBLED THE RECIPE AND ADDED EXTRA GARLIC AND HOT PEPPERS FOR SOME EXTRA KICK . LATER IN THE WEEK i WILL TRY YOUR SRIRACHA TURKEY MEATLOAF AND BLACKENED SHRIMP. I AM CERTAIN THOSE RECIPES WILL ROCK AS WELL, I AM LOOKING FORWARD TO MAKING THEM ! Really yummy! But kinda a pain to pull the meat off the bone with all the sauce. i made this for dinner tonight. My family loved it! I have a very picky family but this was a hit. I made this tonight. I used two chicken breasts, as I don’t care for chicken thighs. I added much more red pepper flakes; my boyfriend loves very spicy food. I let it simmer on very low for 50 minutes. Excellent! Another hit! Last week I made your chicken enchiladas recipe. It is a definite keeper. Thanks, Beth. Sooooo good! Just made this, and the spouse said its “my best meal yet”. I promise I said you had a lot to do with it. I used boneless, and only doubled the crushed red pepper, all else was the same. Thanks so much! YUM! I will definitely be making this recipe all the time. I used four boneless, skinless chicken breasts because they were on a BOGO sale at the grocery store. I also used way more crushed red pepper than the recipe calls for to make it spicier. Probably at least 4x more. I didn’t have chicken broth or white wine so I decided to try 1/4 cup of red wine which worked out just fine. My only issue was that the sauce didn’t seem to get significantly thicker as it simmered. I’m not sure if that’s because I used breasts, or maybe my flour coating was too thin, but I simmered my sauce for much longer than 20 mins and it stayed pretty liquidy. I honestly don’t care though, it was still delicious. By the time I stopped simmering it the chicken was so tender I could break it up with my wooden cooking spoon, yummmm. Served over pasta with a side of sauteed zucchini and squash. Yum yum yum. Can’t say it enough! This dish had great potential. Unfortunately we did not enjoy the chicken itself mainly because the skin had a weird texture to it (I did use drumsticks instead of thighs which is all I had on hand). But next time I’ll just take some roasted chicken and mix it into the sauce, which was absolutely killer. I’m very excited to play with this. Making this right now and my kitchen smells so good! I cannot wait to taste it! Love it! I used 8 boneless, skinless thighs, doubled the red pepper flakes, and pulled some sauce out before I put the chicken back in to put on the pasta for my vegetarian daughter. Perfect meal for us. Super easy and everyone loved it. Definitely made the rotation. Was cooking this last night, and the smell attracted the two college-age boys I work with from across the hall to see if they could beg a piece or five. Thanks! I made this last night, it was fantastic! I added vidalia onion and a little bit of white wine to the sauce. I also doubled the red pepper because we are a fan of the spicy. I used skinless thighs as well, no problem there. Came out absolutely fantastic.